Summary: Simple, comforting chicken and spicy red sauce over pasta — this easy slow cooker recipe takes weeknight dinner to a new level. Spray the inside of the slow cooker crock with nonstick spray. Add the chicken pieces and pour the pasta sauce over. Stir to coat all pieces. About 25 minutes before you are ready to eat, heat a large pot of salted water to boiling. Boil pasta according to package directions, stopping when it is just al dente (firm to the bite). Drain and return pasta to pot, drizzling with a bit of olive oil so it won’t stick. Put the lid back on until you’re ready to serve. To serve, place a portion of pasta in a wide bowl, top with a piece of chicken and some sauce to cover it all. Pass the grated cheese at the table for those who like it. I found this particular shaped pasta at Vons (or Safeway). It’s called Trottole, and the brand is Safeway Select. We love it for the fanciful shape! 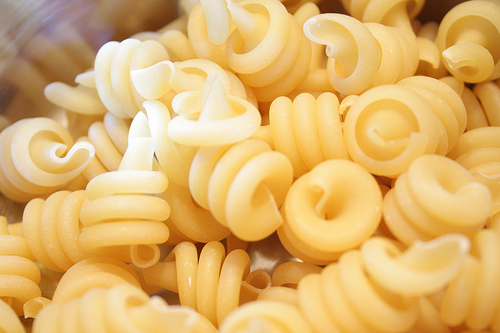 Trottole means “spins,” and it looks like the outside pasta thread is spun around a center pole, like a crazy, loopy fusilli. How do they do this? It’s great for pasta salads, soups, and for grabbing the sauce in any pasta dish. On a whim (and because it was on sale! 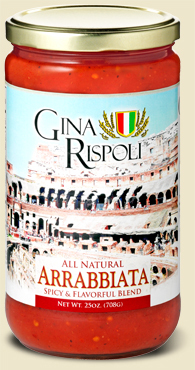 ), I bought Gina Rispoli Arrabbiata sauce. It’s a full-bodied, slightly spicy sauce made from fresh onion and garlic, imported whole Italian tomatoes, crushed tomatoes and crushed red peppers. That’s it! No corn syrup or added sweeteners, no fake stuff. There’s a little bit of heat here, but it won’t blow the top of your head off. I had three children at the table the night I served this, and they all gobbled it up, with two of them asking for seconds.